Habibi Asl, B., Abdelalipur, R., Shahidi, M. (2011). Effects of Caffeine on Morphine Tolerance and Analgesia in Mice. Iranian Journal of Pharmaceutical Sciences, 7(2), 99-106. Bohloul Habibi Asl; Reza Abdelalipur; Mehrdad Shahidi. "Effects of Caffeine on Morphine Tolerance and Analgesia in Mice". 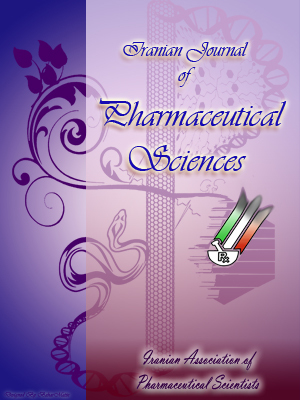 Iranian Journal of Pharmaceutical Sciences, 7, 2, 2011, 99-106. Habibi Asl, B., Abdelalipur, R., Shahidi, M. (2011). 'Effects of Caffeine on Morphine Tolerance and Analgesia in Mice', Iranian Journal of Pharmaceutical Sciences, 7(2), pp. 99-106. Habibi Asl, B., Abdelalipur, R., Shahidi, M. Effects of Caffeine on Morphine Tolerance and Analgesia in Mice. Iranian Journal of Pharmaceutical Sciences, 2011; 7(2): 99-106. Caffeine, an adenosine A1, A2A, and A2B receptor antagonist, is frequently used as an adjuvant analgesic in combination with non steroidal anti-inflammatory drugs or opioids. The aim of this study was to evaluate the effects of caffeine on preventing the development of morphine tolerance and analgesia in mice. In this study, different groups of mice received morphine (30 mg/kg) + saline (10 ml/kg), or morphine (30 mg/kg) + caffeine (10, 15, 25, 50, 75, or 100 mg/kg) i.p. once a day for four days. Tolerance was assessed by administration of morphine (9 mg/kg) and using hot-plate test on the fifth day. Analgesic effects of caffeine also were evaluated alone or in combination with different doses of morphine. It was found that pretreatment with caffeine (75, 100 mg/kg) decreased the degree of morphine tolerance significantly (ppp<0.01). This effect was inhibited by atropine (5 mg/kg, SC). These effects can be related to different mechanisms of caffeine in different doses and the effects of caffeine to the release of acetylcholine. It is known that continuous or long term use of opiate drugs may cause tolerance and dependence which limits the therapeutic efficacy of these drugs [1-3]. With repeated administration of these drugs, adaptive mechanisms are initiated. One such mechanism is the development of tolerance. Another results from development of counter adaptations such that once the drug is removed a sequence of rebound signs and symptoms are manifested. Recent work suggests that these adaptive processes at the cellular, synaptic, and network levels downstream from the receptor may hold the keys to understanding of addiction . Perhaps the most important adaptations that develop as a result of chronic opioid administration occur in neural systems responsible for the transition from casual to compulsive drug use. At the cellular level, adaptive mechanisms that occur with repeated and/or continuous morphine treatment to mediate associative tolerance are probably mediated by separate mechanisms [4, 5]. Although compounds of extremely high potency have been produced, the problem of tolerance and dependence on these agonists persists. Several studies have indicated that different neurotransmitters and receptors are involved in morphine tolerance [6, 7], and the influence of receptors and neurotransmitters on the morphine tolerance and other opioids are contradictory [6, 8]. One of the neurotransmit-ters involved in morphine tolerance is adenosine. Caffeine, a mild stimulant, is the most widely-used psychoactive drug in the world (Goodman). Caffeine is rapidly distributed throughout all tissues and easily crosses the placenta and brain barrier. Caffeine has intrinsic antinociceptive properties and is frequently used as an adjuvant analgesic drug [8, 9]. It is thought that caffeine analgesia is produced, at least in part, through adenosine receptor antagonism. The adenosine receptor family comprises four subtypes: A1, A2A, A2B, and A3 . They are widely distributed in CNS and peripheral tissues. The A1 receptors are found in high density in the brain (cortex, cerebellum, and hippocampus), the dorsal horn of the spinal cord, at lower levels in other brain regions, and in peripheral tissues [10, 11]. Caffeine is an adenosine A1, A2A, and A2B receptor antagonist. In this study, we examined the role of caffeine on morphine tolerance and analgesia in mice. We demonstrated analgesic and anti-analgesic effects of caffeine in different doses in mice. Figure 1. Analgesic effects of morphine on (○) tolerant and (●) non-tolerant mice. Animals received either saline (10 ml/kg,i.p.) or morphine (30 mg/kg, i.p.) for 4 days. Antinociception of a test dose of morphine (9 mg/kg, i.p.) was tested 24 h afterthe last dose of morphine (30 mg/kg, i.p.) in tolerant and non-tolerant mice. Each group had at least 9 mice. Results are expressed as Mean±SE. *Significantly different from tolerant group (p < 0.05), ** (p < 0.01). Table 1. Analgesia induced by i.p. administration of caffeine. All administrations were i.p. Latency time was measured as explained under materials and methods by hot plate test; *Significantly different from Base line (p < 0.01). Male albino Swiss-Webster mice (20-30 g, Razi Institute, Tehran, Iran) were used throughout the study (9 mice for each experiment). Animals were housed under a 12/12-h light cycle (07:00–19:00), with food and water available ad libitum. The animals were randomly allocated to different experimental groups. Morphine sulfate (Darupakhsh, Iran), powder of anhydrous caffeine (Hunan Pharmaceutical Factory), atropine (Darupakhsh, Iran) were used. Figure 2.. Effects of different doses of caffeine (75, 100 mg/kg, i.p.) on tolerance determined by hot-plate test in morphinetolerantmice. Each group had at least 9 mice. Results are expressed as Mean±SE. *(p < 0.05), **(p < 0.01),***(p < 0.001) Significantly different from the control group [morphine (30 mg/kg)]. Hot-plate test: each animal was placed on a surface (23×23 cm) maintained at 55±2 ºC surrounded by a Plexiglas wall 20 cm high. Licking of hands was used at the end point for determination of response latencies. Failure to respond by 45 seconds was a marker for termination of the test (cut off). In order to induce tolerance, groups of 9 mice were chosen randomly. Mice were treated intraperitonealy (i.p.) by morphine (30 mg/kg) in combination with either caffeine or saline or both once a day for four days. To evaluate the degree of tolerance, the antinociceptive effect of a test dose of morphine (9 mg/kg) was measured 24 h after the last dose of morphine in combination with caffeine or saline or both. Analgesic effects of caffeine (10, 15, 25, 50, 75, 100 mg/kg, i.p.) were evaluated alone or in combination with different doses of morphine (3, 6, 9 mg/kg, IP). The results are expressed as the Mean±SE. Differences between the individual mean values in different groups were analyzed by one-way analysis of variance (ANOVA). Differences with a p < 0.05 were considered significant. Figure 3. Effect of atropine (5 mg/kg, s.c.) on tolerance induction by morphine + caffeine co -administration. Each group had at least 9 mice. Results are expressed as Mean ± SE. As shown in Figure 1, animals received morphine (30 mg/kg, i.p.) once a day for four days, and in each mice antinociceptive response to a test dose of morphine (9 mg/kg, i.p.) was assayed 24 h after the last dose of morphine. Animals that became tolerant to effects of morphine exhibited only a small antinociceptive effect. Table 1 shows the response of various doses of administration of caffeine (i.p.) in hot-plate test. Animals received saline (10 ml/kg, i.p.) or different doses of caffeine (5, 10, 15, 25, 50, 75, 100 mg/kg, i.p.). As shown in Table 1, only caffeine with a dose of 100 mg/kg, produced a significant (p < 0.05) antinociceptive effect as compared to the saline in hot-plate test. Figure 4. Figure 4. Effects of caffeine (25 mg/kg, i.p.) + morphine (3 mg/kg, i.p.) on analgesia determined by hot-plate test. Results expressed as Mean±SE of 9 mice. ; ** (p < 0.01) Significantly different from the control group [morphine (3 mg/kg)]. Figure 5. Effects of caffeine (15 mg/kg, i.p.) + morphine (6 mg/kg, i.p.) administration on analgesia determined by hot-platetest. Results expressed as Mean±SE of 9 mice. *(p < 0.05, ***(p < 0.001) Significantly different from the control group [morphine (6 mg/kg)]. As shown in Figure 2, caffeine injection (75, 100 mg/kg, i.p. ), 30 min before daily morphine administration, significantly decreased tolerance to the analgesic effects of morphine (p < 0.01). Figure 3 shows that pretreatment with atropine (5 mg/kg, s.c.), 30 min. before daily morphine and caffeine co-administration, changed morphine tolerance, significantly. Figure 6. Effects of caffeine (10, 50 mg/kg, i.p.) + morphine (9 mg/kg, i.p.) administration on analgesia determined by hotplate test. Results expressed as Mean±SE of 9 mice. *(p < 0.05), **(p < 0.01), ***(p < 0.001) Significantly different from the control group [morphine (9 mg/kg)]. Figure 7. Effects of caffeine (50, 75, 100 mg/kg, i.p.) + morphine (3 mg/kg, i.p.) administration on analgesia determined by hot-plate test. Results expressed as Mean±SE of 9 mice. **(p < 0.01), ***(p < 0.001) Significantly different from the control group [morphine (3 mg/kg)]. Table 1 shows the effects of different doses of caffeine (5, 10, 15, 25, 50, 75, 100 mg/kg, i.p.) on morphine-induced antinociception in hot-plate test. Figures 4 to 7 show the results of co-administration of caffeine (5, 10, 15, 25, 50, 75, 100 mg/kg, i.p.) with morphine (3, 6, 9 mg/kg, i.p.). It was found that the combination of caffeine (10, 15, 25, 50 mg/kg, i.p.) with morphine (3, 6, 9 mg/kg, i.p. ), decreased the analgesic effect of morphine, significantly (p < 0.01). But high doses of caffeine (100 mg/kg) increased the analgesic effect of morphine, significantly (p < 0.01). Figure 8 shows the effect of atropine (5 mg/kg, s.c.) on analgesia induced by the administration of caffeine+morphine in hot-plate test. Animals which received caffeine (100 mg/kg, i.p.) with morphine (3 /kg, i.p. ), showed increased analgesic effect of morphine (p < 0.05). This effect was inhibited by atropine (5 mg/kg, s.c.) pretreatment (15 min). In this study, we evaluated the effects of systemic administration of caffeine (Adenosine A1 , A2A, and A2B receptor antagonist) on morphine tolerance and analgesia in mice. Results indicated that injection of caffeine, 30 min. before daily administration of morphine, decreased tolerance to the analgesic effects of morphine, significantly. On the other hand, administration of atropine, before daily co-administration of morphine and caffeine changed in morphine tolerance, significantly. In several studies [12, 13] repeated injections of morphine, cocaine, and amphetamine showed an increase in presynaptic inhibition caused by endogenous adenosine. Originally done in brain slices from guinea pigs treated with either morphine or cocaine, the presynaptic regulation of the GABAB IPSP measured in dopaminergic cells of the VTA was changed in drug-treated animals, significantly. This work showed that the activation of adenylyl cyclase by either D1 receptors or forskolin had two opposing actions. One was to augment GABA release through the activation of PKA, and the second was to inhibit GABA release by activation of a presynaptic A1 adenosine receptor. In slices from drug-treated animals, the enhancement of inhibition by adenosine was so great that the effect of D1 receptor activation reversed direction and inhibited, rather than augmented, GABAB IPSPs. This inhibition was blocked by adenosine receptor antagonists and agents that blocked the transport (Probenecid) or metabolism (a phosphodiesterase inhibitor) of cAMP. The opposing actions of forskolin have been reported in several brain areas [14-18]. In general, the persistent increase in extra-cellular adenosine is occurred in repeated injections of morphine. Then, effects of caffeine (morphine tolerance inhibition) are believed to occur by means of competitive antagonism at adenosine receptors. On the other hand, this effect was inhibited by atropine pretreatment (15 min.). Thus, the mechanism of caffeine on morphine tolerance seems to be dependent on cholinergic activation. Figure 8. Effects of atropine (5 mg/kg, s.c.) on analgesia induced by combination of caffeine (100 mg/kg, i.p.) + morphine (3 mg/kg, i.p.) administration, determined by hot-plate test. Results expressed as Mean±SE of 9 mice. *(p < 0.05) Significantly different from the control group. The second part of this study examined analgesia induced by treatment with caffeine. In different doses of caffeine, as shown in Table 1, only caffeine with a dose of 100 mg/kg, produced a significant antinociceptive effect as compared to the saline in hot-plate test. Combination of caffeine with morphine decreased morphine analgesic effect, but high doses of caffeine (100 mg/kg) increased the analgesic effect of morphine, significantly.Adenosine has dual activity on nociception.It acts centrally within the spinal cord to suppress nociceptive signaling , presumably through the activation of A1 and A2 adenosine receptors . In the periphery, adenosine has algogenic activity, which is probably mediated by A2 receptors [19, 21]. Caffeine, a virtually nonselective A1-, A2A, and A2B-adenosine receptor antagonist,exhibits antinociceptive effects in high doses. Thus, caffeine acts centrally in high doses within the spinal cord to suppress nociceptive signaling. Other activities of caffeine (alteration of catecholamine or acetylcholine release and turnover, inhibition of phospho-diesterase, influence on intracellular calcium concentrations, and interaction with GABAA receptors) may contribute to its antinocicep-tive effects [19, 22]. Of course for clarifying the exact effects, further studies are required. Special thanks, and gratitude goes to those who helped us in carrying out the study successfully, especially the Pharmacology Department of Tabriz University of Medical Sciences for their helpful supports. Vadivelu N, Mitra S, Narayan, D. Recent advances in postoperaive pain management. Yale J Biol Med 2010; 83: 11-25. Chan SL, Chou CC, Wong CS, Wu CC, Tao PL. Study the effect and mechanism of dextromethor-phan on preventing the development of morphine tolerance and dependence in rats. J Med Sci 2002; 22: 171-6. Tokuyama S, Wakabayashi H, Ho IK . Direct evidence for a role of glutamate in the expression of the opioid withdrawal syndrome. Eur J Pharmacol 1999; 295;123-9. Mitchell JM, Basbaum AI, Fields HL. A locus and mechanism of action for associative morphine tolerance. Nat Neurosci 2000; 3: 47-53. Christie MJ, Williams JT, North RA. Cellular mechanisms of opioid tolerance: studies in single brain neurons. Mol Pharmacol 1987; 32: 633-8. Williams JT, MacDonald JC, Manzoni O. Cellular and synaptic adaptations mediating opioid dependence. Physiol Rev 2001; 81: 299-343. Roerig SC. Spinal and supraspinal agmatine activate different receptors to enhance spinal morphine antinociception. Ann N Y Acad Sci 2003; 1009: 116-26. Malec D, Michalska E. The effects of methylxanthine on morphine analgesia in mice and rat. Pol J Pharmacol Pharm 1988; 4: 223-32. Ghelardini C, Galeotti N, Vivoli E, Grazioli I, Uslenghi C. The central analgesia induced by antimigraine drugs is independent from Gi proteins: superiority of a fixed combination of indomethacin, prochlorperazine and caffeine, compared to sumatriptan, in an in vivo model. J Headache Pain 2009; 10: 435-40. Fredholm BB, AP IJ, Jacobson KA, Klotz KN, Linden J. International Union of Pharmacology. XXV. Nomenclature and classification of adenosine receptors. Pharmacol Rev 2001; 53: 527-52. Rivkees SA, Price SL, Zhou FC. Immunohisto-chemical detection of A1 adenosine receptors in rat brain with emphasis on localization in the hippocampal formation, cerebral cortex, cerebellum and basal ganglia. Brain Res 1995; 677:193-203. Thomas MJ, Kalivas PW, Shaham Y. Neuroplas-ticity in the mesolimbic dopamine system and cocaine addiction. Br J Pharmacol 2008; 154: 327-42. Fiorillo CD, Williams JT. Selective inhibition by adenosine of mGluR IPSPs in dopamine neurons following cocaine treatment. J Neurophysiol 2000; 83: 1307-14. Ferre S, Diamond I, Goldberg SR, Yao L, Hourani SM, Huang ZL, Urade Y, Kitchen I. Adenosine A2A receptors in ventral striatum, hypothalamus and nociceptive circuitry. Implications for drug addiction, sleep and pain. Prog Neurobiol 2007;83: 332-47. Chieng B, Williams JT. Increased opioid inhibition of GABA release in nucleus accumbens during morphine withdrawal. J Neurosci 1998; 18: 7033-9. Lu KT, Gean PW. Masking of forskolin-induced long-term potentiation by adenosine accumulation in area CA1 of the rat hippocampus. Neuroscience 1999; 88: 69-78. Manzoni O, Pujalte D, Williams JT, Bockaert J. Decreased presynaptic sensitivity to adenosine after cocaine withdrawal. J Neurosci 1998; 18: 7996-8002. Geoffrey Burnstock. Adenine nucleosides and nucleotides in biomedicine. Purinergic Signal 2010; 6: 1-162. Sawynok J, Yaksh TL. Caffeine as an analgesic adjuvant: a review of pharmacology and mechanisms of action. Pharmacol Rev 1993; 45: 43-85. DeLander GE, Hopkins CJ. Spinal adenosine modulates descending antinociceptive pathways stimulated by morphine. J Pharmacol Exp Ther 1986; 239: 88-93. Karlsten R, Gordh T, Post C. Local antinocicep-tive and hyperalgesic effects in the formalin test after peripheral administration of adenosine analogues in mice. Pharmacol Toxicol 1992; 70: 434-8. Daly JW. Alkylxanthines as research tools. J Auton Nerv Syst., 2000; 81: 44-52.